Given that Arrow can’t seem to write a single episode without two writers, I think it’s only fair that I present a twofer review! Let’s take them one at a time though. 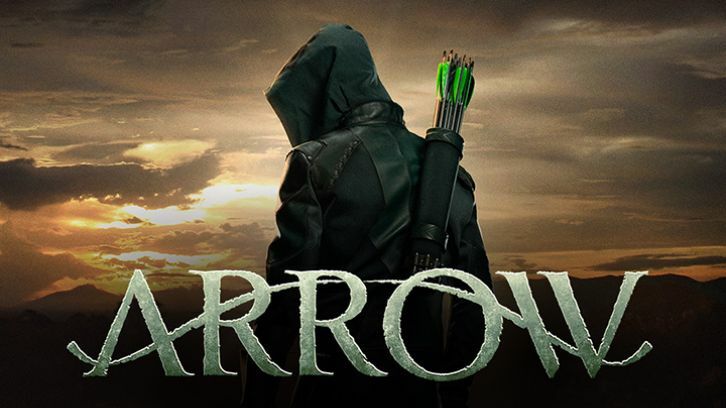 Arrow “The Demon” was written by the team of Benjamin Raab and Deric A Hughes and was directed by Mark Bunting. This is Raab and Hughes’s first Arrow episode but they’ve also teamed up to write for The Flash, Beauty and the Beast, and Warehouse 13. The episode is most notable for the return of Lexa Doig as Talia al Ghul. So there were actually more things that I liked about this episode than I disliked. 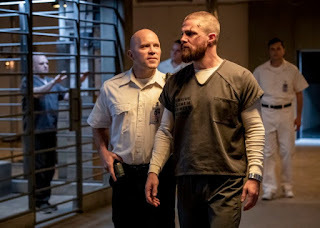 I really, really liked Oliver (Stephen Amell) telling Talia that he’s trying to break the cycle of violence in his life that she started by telling him to act on his father’s list. I also liked that we pretty quickly see that Oliver hasn’t been brainwashed – but he’s convinced Parker (Jason E Kelley) to let him move on to Phase 2. I also liked that Oliver can’t keep the Green Arrow down and agrees to help Talia escape so that he can help his fellow prisoners. I loved the scam that Oliver and Talia pull on the guards and the subsequent scene when they try to zap them with their bracelets and it doesn’t work. Oliver’s punching with the chain was a nice move. One of the best scenes in a long time was the Oliver/Talia/guards fight in the hall. Great stunts and I loved the ariel shots – and Oliver with that chain! I also liked that Oliver didn’t leave with Talia because it would mean he’d be a fugitive for life, but I’m totally over his self-punishment. 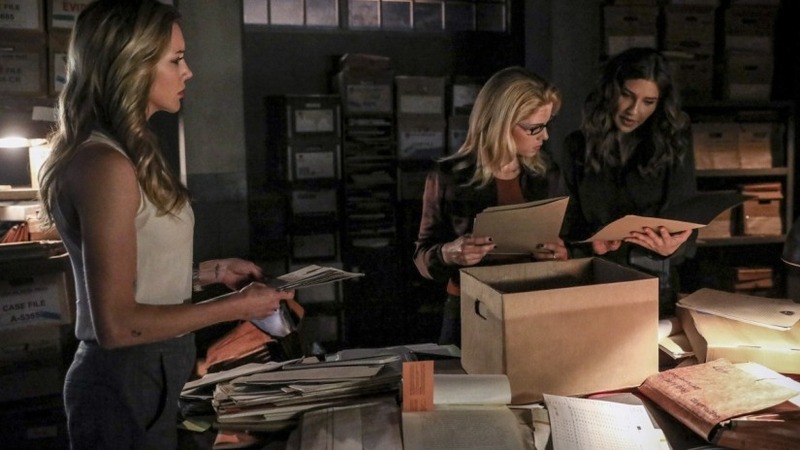 I’m still really enjoying Laurel (Katie Cassidy) and Felicity (Emily Bett Rickards) working together. I’m particularly enjoying Katie Cassidy’s performance this season – sassy with a splash of dark and trying to do better suits her! 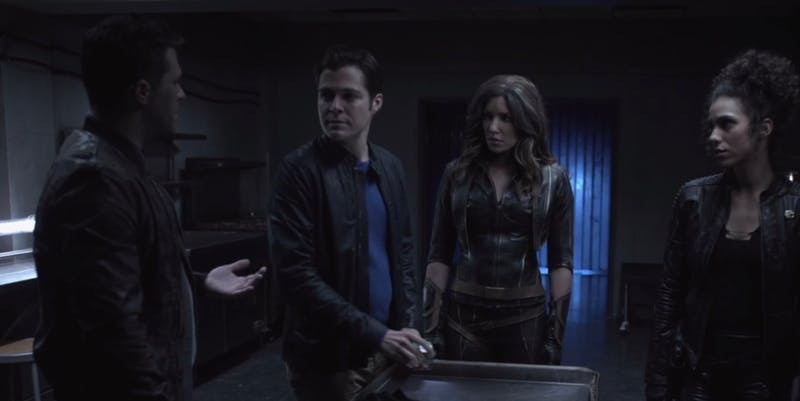 I don’t think we need the third musketeer of Dinah (Juliana Harkavy), however – even if she does provide useful help in getting to the records and breaking the prisoner abuse scandal. 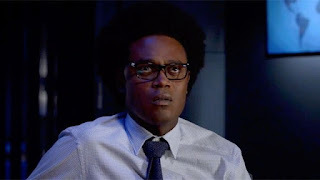 Curtis (Echo Kellum) is far from my favorite character, and the show has played with Diggle’s (David Ramsey) character so much that I don’t recognize him anymore. That said, I did like the basic storyline of the sting – which was pretty badass - maybe a holdover from the Warehouse 13 days of the writers? Curtis certainly looked a lot better without that stupid hair and ridiculous costume. Even this storyline had some glaring annoyances though. Curtis’ French accent? Would not have fooled anyone! So AWFUL! And FOURTEEN PhDs??? Not even remotely possible. You can't get one a year… just a stupid detail. I will give Kellum props for a good performance here - other than the dreadful accent. I liked how he got over being terrified to go back in the field. Arrow “Due Process” was written by the team of Sarah Tarkoff and Tonya Kong and was directed by Kristin Windell. This episode was completely overshadowed by the lazy writing that yet again has the criminal mastermind bent on destroying what Oliver loves – Star City – and this time it’s Diaz (Kirk Acevedo). Is it impossible for this show to find a new storyline? I realize that this is a standard comic trope – but find new ground after 7 years!!! Still, there were a few little highlights. 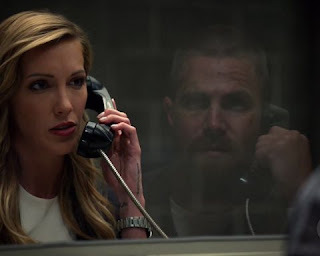 Once again, Katie Cassidy shines – and this time Amell shines with her in the scenes at the prison when Laurel tries to get him to let her help him. Both these scenes were gold. The first is notable for Oliver telling her that she doesn’t trust her and to stay away from Felicity to which she replies that she sees her Ollie in him. The second is terrific as Laurel tells Oliver that everyone has good and bad in them, and you can’t put them in a box. This is excellent advice that Oliver should think about. I also loved them using the reflection of the glass to drive home the two sides of a coin point. I liked that they managed to save Anatoly (David Nykl) – and ultimately send him into hiding – like that will work any better for him than it has for anyone else! However, I didn’t like that we see everyone descend on the warehouse separately in a disorganized mess yet again. I just keep feeling like I’m watching all the same scenes over again! I am not enjoying Felicity’s slow slide into the dark side. Do they have to do this with every character? And haven’t they already done it with her anyway? And we have Diggle as the angel on her shoulder, telling her to be careful, and Anatoly as the devil, telling her to embrace evil without half measures. I did like the chain of Dinah stopping Laurel from attacking the Judge (Sheila Tyson) and then Laurel stopping Felicity from shooting Diaz after making a deal with the feds to trade Diaz for Oliver – thus allowing Diaz to get free again – which I know didn’t happen in this episode, but will… On a more positive note, Acevedo was really good at being an angry psycho in this episode! The final confrontation in which they have to disarm the bombs simultaneously was a pretty good rumble. Lots of nice explosions and a nice fight sequence – I especially liked the body bouncing off the fence. However, the Longbow Hunters all get away, and Diggle manages NOT to hit Diaz from 10 feet away again. At least, they get him in custody. And then there are the flash forwards. 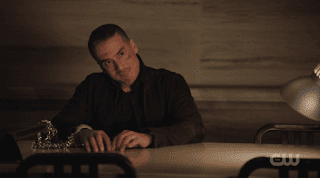 I was so excited that we were getting Colton Haynes (Roy) back on the show – and so far, it has simply been disappointing to have him shunted into this annoying storyline that pops up in every other episode. All we learn this week is that William (Ben Lewis) and Zoe (Andrea Sixtos) remember each other from when they were kids, Felicity has left a plan for blowing up Star City, and evil-Felicity only died a couple of weeks ago. Whoopee. I’m more annoyed by the bits of information than intrigued. Finally, Oliver investigates Dunbar’s (Tim Howe) murder to help Stanley (Brendan Fletcher) who’s been accused of the murder. He proves it was Turner (Michael Jai White) by finding his blade in the shower with Dunbar’s blood on it. This gets Stanley released – and when Stanley knows it was Turner without being told, Oliver is finally suspicious. Really? 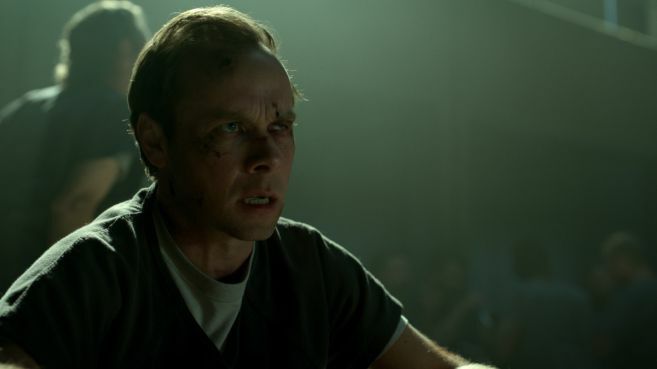 Will anyone be surprised when we find out that Stanley is truly the Demon – and that he likely did kill Dunbar himself with Turner’s blade to frame him? Somehow or another, Oliver and Stanley are both going to end up on the outside at the same time… I’m betting on it. So, I guess I’d have to give “The Demon” a thumbs up and “Due Process” a neutral rating. The story was terrible, but it was saved by a couple of good performances. What did you think of the two episodes? Let me know your thoughts in the comments below!